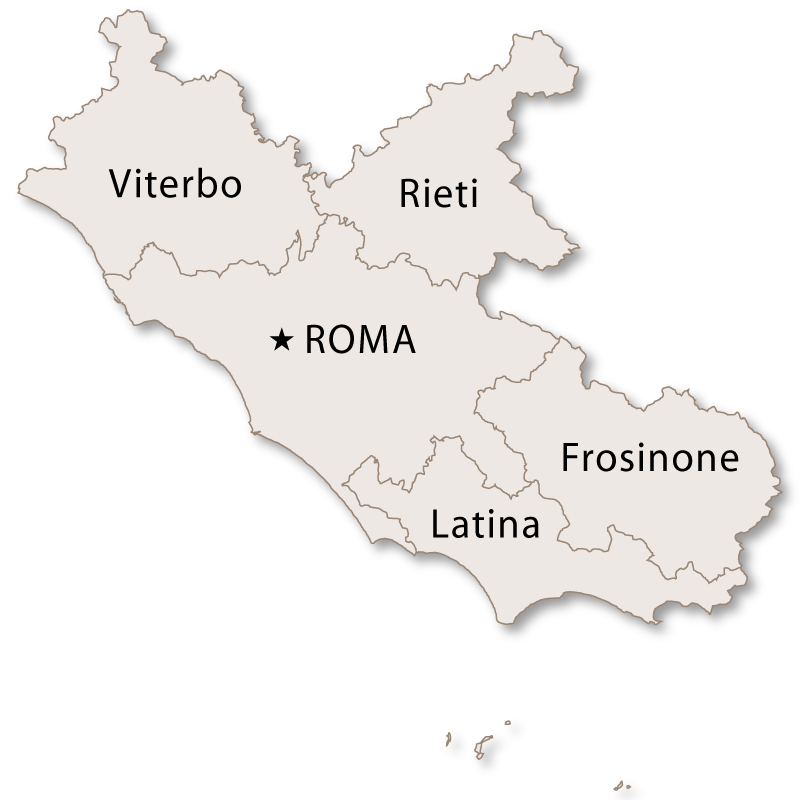 The Province of Rieti covers an area of 2,749 sq.km and borders the provinces of Roma and Viterbo to the west, the region of Umbria to the north, the region of Marche to the east and the region of Abruzzo to the south. 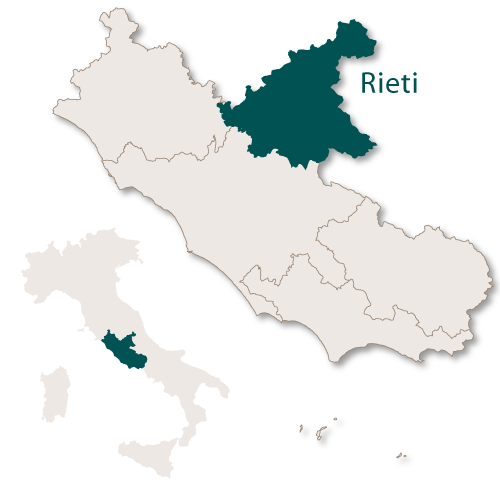 Positioned inland, almost exactly in the centre of Italy, the province of Rieti is mainly mountainous with the highest peak being Monti della Laga at 2458 metres. 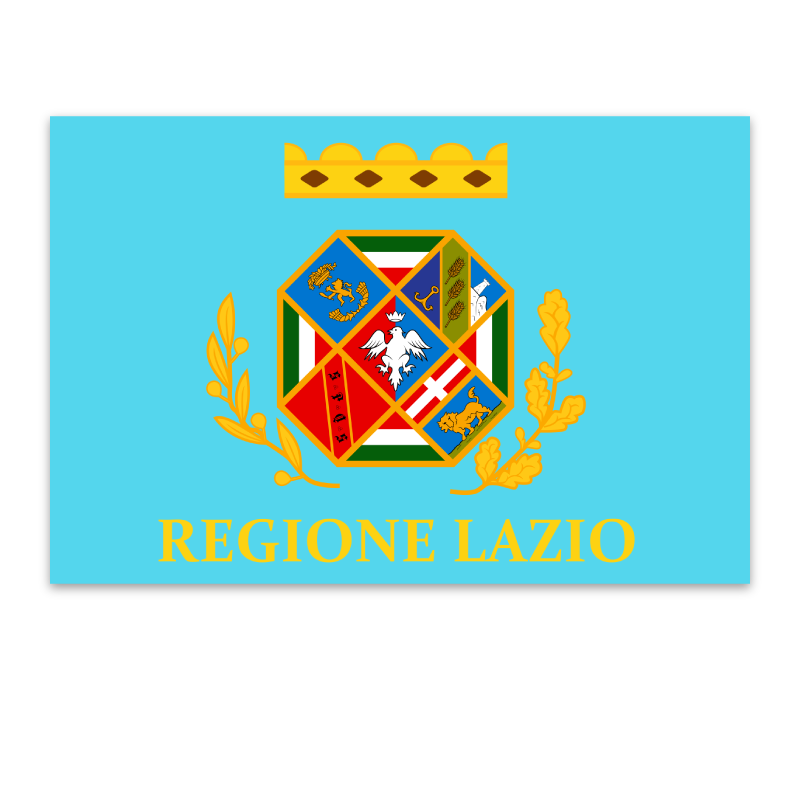 Within this province there are also two, large and significant artificial lakes, Lago del Salto and Lago del Turano. Lago del Salto is the largest in the whole of the region and lies at an altitude of 1,755 metres above sea level. Many national parks cross over or spill into this province giving it an abundance of beautiful, protected countryside and significant flora and fauna. The natural park of Monti Lucretili stretches across the southern areas while the natural reserve of Montagne della Duchessa covers the southeastern portion. 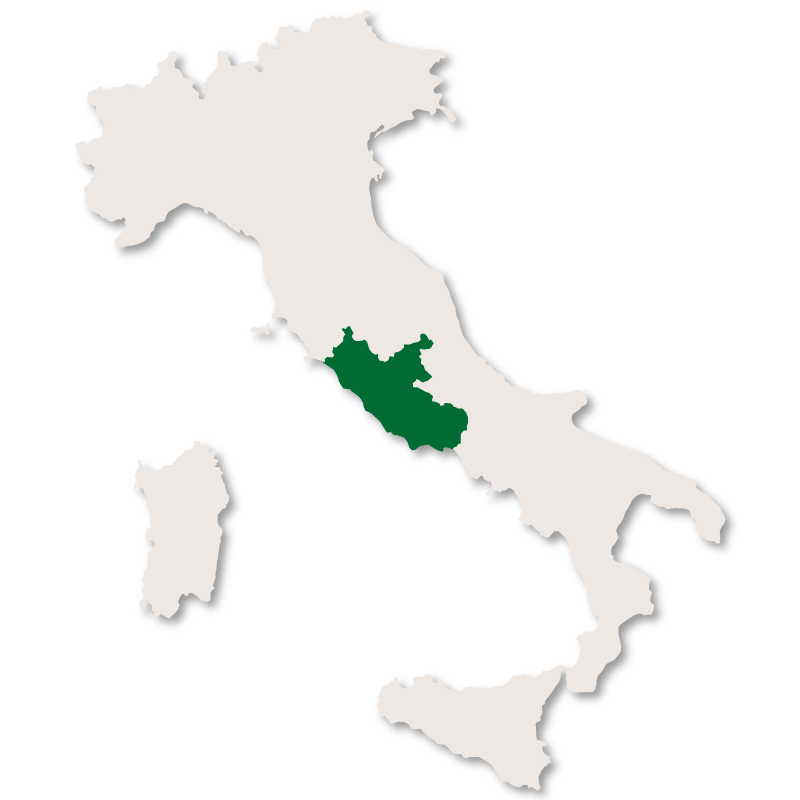 Between the lakes of Salto and Turano there is the Natural Reserve of Monte Navegna and Monte Cervia and in the east the National Park of Gran Sasso and Monti della Laga just spreads into the province of Rieti. 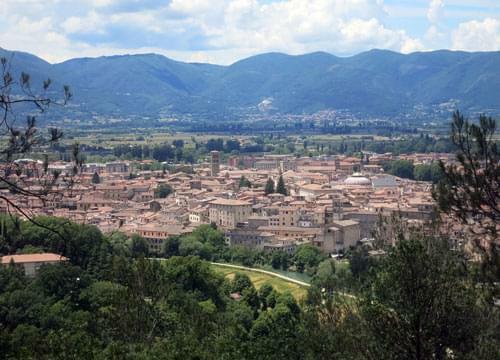 It is the capital city of province of Rieti and rests on top of a small hill overlooking the wide, fertile valley of the Velino river. The old historic centre is surrounded by very well preserved walls dating from the first half of the 13th century. There are five gates spread along the length of the wall, Porta d'Arci, Porta Conca, Porta San Giovanni, Porta Cintia and Porta Romana. 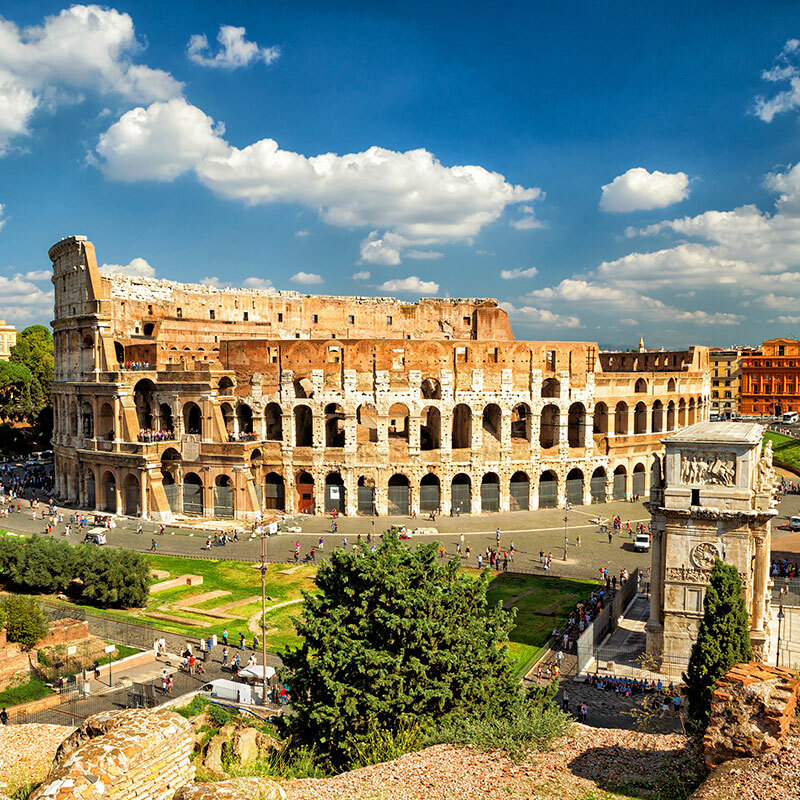 This ancient Roman city was once a thriving community with many buildings and thermal baths but very few of the original foundations remain. 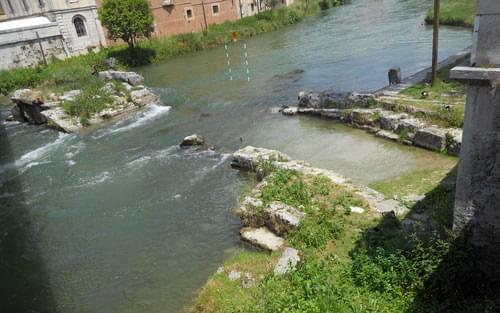 Extensive excavations took place during the 19th and 20th centuries and the main find was that of the 3rd century Roman stone bridge which crosses the river Velino. Other than that, the foundations of a large temple, the stone floor of the forum, crumbling remains of walls of private houses and some pottery and statues have been found. Rieti is a small, friendly city with much to see and do and plenty of places to eat, drink and generally watch the world go by. 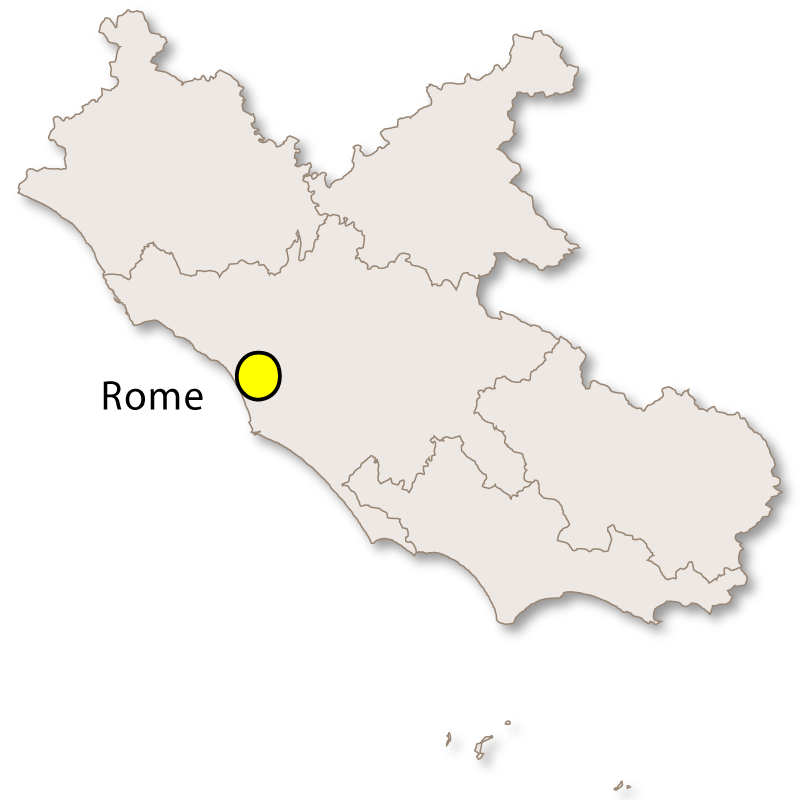 Piazza San Rufo is commonly known as the Naval of Italy due to the fact that it is considered to be the exact centre of Italy. The Cathedral which was built in the early 12th century and consecrated in 1225. 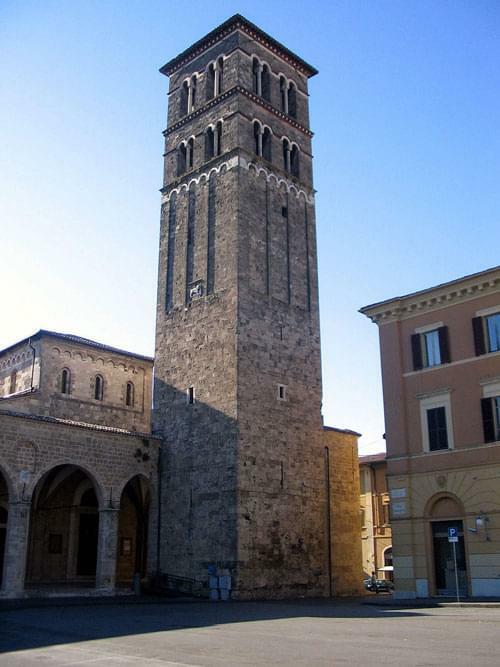 The Romanesque bell tower was added in 1252 and is an impressive piece of architecture. Internally the Cathedral is decorated mainly in the Baroque style and has a delicate 15th century font. The Bishops Palace (Palazzo Vescovile) was built in the late 13th century and has a memorable lggia and eight Renaissance windows which were added in the 1532. The 13th century Town Hall (Palazzo Comunale) can be found on Piazza Vittorio Emanuele II and houses the city's museum. The Palazzo del Governo, built in the 16th century and also has a pretty loggia. Palazzo Vicentini is a three storey building on one side of the Piazza Cesare Battisti and is one of the most beautiful examples of architecture in Rieti. The church of St.Peter the martyr which was built in the 13th century and has ostentatious golden decorations in the Baroque style. The 13th century gothic church of Sant'Agostino which has been very sympathetically restored during the 18th century. Santa Maria in Vescovio was built is an 8th century church which was altered to its current Romanesque appearance during the 12th century. Inside there are frescoes illustrating the Last Judgement and scenes from both the Old and New Testaments. The church of St. Francis, built in 1245 and almost completely restored in 1636. This church is very close to the shores of the River Velino and the floor levels have had to be raised to reduce the risk of flooding. Located near the site of an early Roman Sabine settlement named Viario, the rare remains of which were found by the medieval tower. 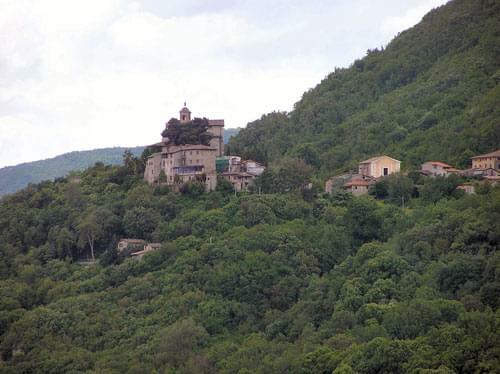 This village is also the birthplace of Giulo Pezzola who was an infamous 17th century outlaw. 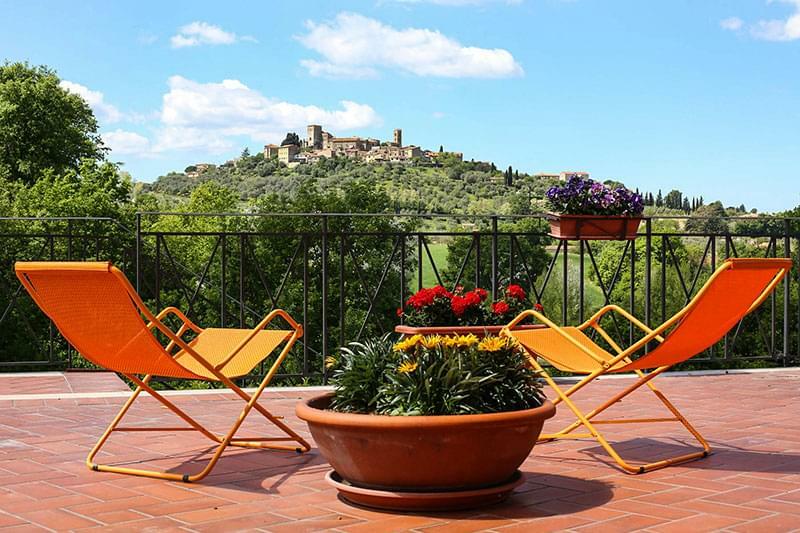 Located very close to Lago Turano, this pretty village is sourrounded by 15th century walls and has a Baronial castle. 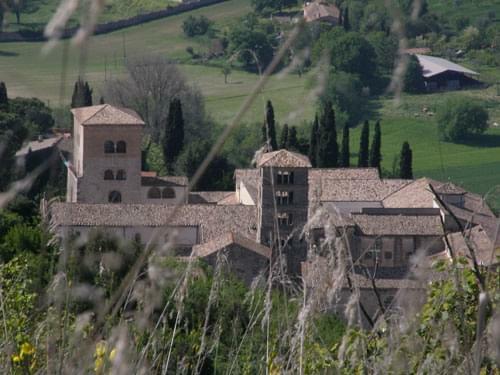 Just outside this town you can find one of the most famous abbeys in Europe, Farfa Abbey (Abbazia di Farfa). It belongs to the Benedictine Order and has a Cathedral with a large Romanesque gate and some stunning floral freizes. One of the interior walls has a fresco depicting the Last Judgment. There was once a castle here but now there is only one tower remaining and that has been incorporated with the Church of San Michele and is used as the bell tower. Saint Francis passed through here on his journey across the region and in December 1223 he constructed the first presepe (crib) in Italy. He did this in the hope of stopping pilgrims visiting Bethlehem which was a risky venture in those days. The tradition has continued and Italians have a presepe set up in their houses every Christmas. This village is famous for St Francis of Assisi visiting there in 1208. He greeting the villagers by saying 'Buon giorno, buona gente' which means 'Good morning good people'. The village now has a gothic arch, aptly named Buon Giorno to commemorate the event. This small, agricultural village is home to the Santacittarama Theravada Buddhist monastery. The 1084 Sforza Cesarini castle can be found here and just outside the village there are the remains of the ancient Sabine town called Trebula Mutusca. The little village of Amatrice is famous for its Sugo all'Amatriciana pasta sauce which has become the most famous sauces in the region of Lazio and popular around the rest of Italy. Over many centuries, according to popular tradition, several popes employed cooks who came from Amatrice.